The first step in becoming a high performing salesperson or sales organization is to determine your targets. But most of us aren’t thoughtful enough about this process. If a company spends money in our category – especially if it’s a lot of money – we believe that they are a target. If we are really hungry, it doesn’t matter how much money a company spends in our category, we pretend that they are a target. This is why I write about “dream clients.” It very much matters whom you consider a target. The primary factor in determining who is and who is not a dream client is not how much money they spend, although that is a factor. The primary factor in determining who is a dream client is whether or not you can create breathtaking, jaw-dropping, earth shattering, results delivering value for that client. I use ideas like “breathtaking,” and “earth shattering,” because I’m trying to make a point. It’s hyperbole, but the point is this: you need to be able to make a significant difference in their business. You can help your “prospects.” What you sell is important to them, and they generally have the kind of problems you can solve. But the level at which they experience these problems isn’t so great that solving them is of great strategic importance. Salespeople and sales organizations ask me what they need to do to be more compelling. When they ask this question what they are really asking is why their offering doesn’t create a great sense of urgency on the part of their prospective client. And the reason it doesn’t create urgency is that there isn’t enough dissatisfaction, the problem isn’t big enough, and the challenges aren’t strategic enough that it is imperative that the prospects solve them. This is different for dream clients. For your dream clients their problems, challenges, and opportunities are so great that what you sell can make a tremendous difference. As an offshoot of that, they do tend to spend more in your category. They do tend to have greater needs. They do tend to perceive the kind of value that you create as critical to their success. But these accounts are harder to break open. They have existing relationships. And they don’t easily change because their partners are integrated into their processes. And because they’re difficult again, most salespeople give up pursuing them. For whom do you create the greatest level of value? Who has a set of problems or challenges that your solution can immediately eliminate or improve? 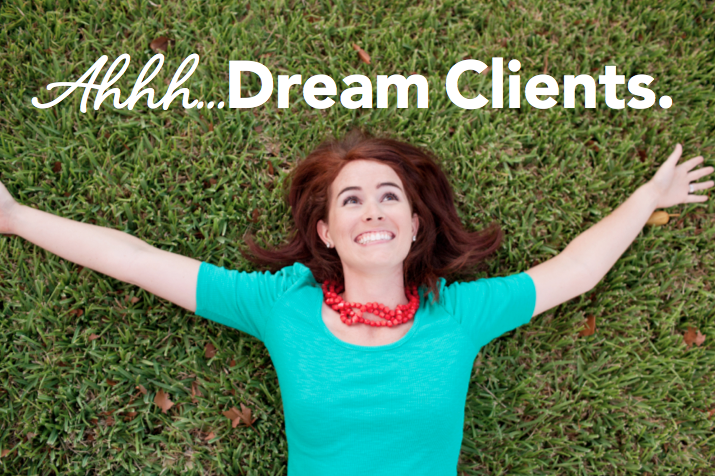 Which of your “dream clients” would perceive what you do as the highest level of value for them? These are your real targets. This is where you should invest your time and attention. Please send me your thoughts and ideas. I love to read your stories. Even though it takes me time to catch up on my email, I will reply (and I do appreciate your patience). Spend your time this week focused on you dream clients!